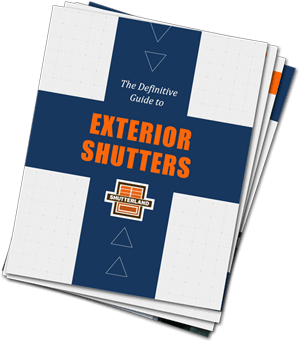 Determine how to measure for exterior shutters by first deciding if the shutters will fully close and cover window (functional) or will be purely decorative (stationary). Specific step-by-step measuring instructions are given below based on the intended exterior shutter operation. Observe and make note of any obstructions on either side of the window which may prevent proper installation of exterior shutters (downspouts, building corners, roof lines, flagpole mounts, etc.). Pay particular attention to the space between neighboring windows to establish adequate proportions and that adjacent shutters will not collide. Solid exterior shutters, in conjunction with quality outdoor hardware, can be installed to swing open and closed. Measure each window with great precision to ensure a smooth installation. ShutterLand composite and wood shutters are crafted in 1/4 inch width and height increments. Measure for exterior shutters starting with the inside window opening depth. Premium wood shutters are 1-1/2 inch thick, composite shutters are 1-1/4 inch thick, and pine shutters are 1 inch thick. The shutter panel should fit almost entirely within the opening. Select from several types of exterior shutter hinges for the best overall size and function. Shutter hardware can be purchased from an online exterior shutter hardware supplier. Measure from the inside left of the window opening to the inside right. Survey three places and record the narrowest dimension, then deduct 1/2 inch for adequate margin when closing. Divide this calculation by two (2) for the individual exterior shutter width. Windows measuring less than 32 inches wide may use a single shutter that opens to one side. Measure from the inside top of the window opening to the inside bottom. Assess in three places and record the narrowest amount, then deduct 1/2 inch to maintain clearance when closing. This is the panel height. A divider rail is a horizontal bar, much like the top rail, that creates top and bottom louver areas within the exterior shutter. The divider rail is optional on all louvered and paneled shutters under 70 inches, and is required on combination shutters and all other panels in excess of 70 inches. A third center batten is required on board and batten shutters over and optional under 55 inches in height. The divider rail location can be centered by default or at a custom location. If a custom location is required, provide the measurement from the bottom of the shutter to the desired center of the divider rail. Tip: If there is an existing horizontal division (created by a transom, mullion, or window sash) in the window, it is often best to align the shutter divider rail at the same height. The actual divider rail location will be as close to specified as possible because louver number and spacing dictates final placement. Large functional exterior shutters may require more support than two hinges can provide. A divider rail is essential to affix a third hanging hinge. Windows without adequate depth to accommodate shutters that nest inside the opening will need to install in front of the casing with new construction shutter hinges. Measure from the outside left of the window casing, or trim, to the outside right. Divide this measurement by two for the individual shutter width. Measure from the outside top of the window casing to the top of the sill, or bottom of the casing if there is not sill. This is the panel height. Composite shutters can be installed with functional hardware, but have a flat non-decorative back, which will be visible when the shutters are rotated over the window in a closed position. All styles of composite exterior shutters are heavier than their wood counterparts. Composite shutters may need additional hinges to support the additional weight. Exterior windows have many variables (siding material, casing width, etc.) which results in a modified approach to each application. The instructions furnished here need to be adapted for your house configuration. Shutters installed for only aesthetic purposes are not restricted by exact fit requirement. The goal for decorative shutters is to make them symmetrical to the size of the window. The preferred appearance for stationary shutters is to simulate those that are functional, aligning with the window opening. Follow the instructions above on how to measure for exterior shutters to complete this outcome. Some windows are wider than what could logically contain two shutter panels. 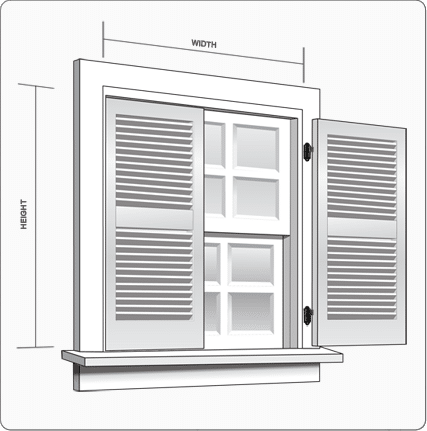 Follow the steps below to guide you through how to measure wide windows for exterior shutters. Windows wider than 64 inches will need to use shutters that are narrower than optimal. Use the widest possible to accent the home. Shutter size should be between 30-50% of the window width in order to remain aesthetically pleasing. Never install house shutters that are wider than the window. 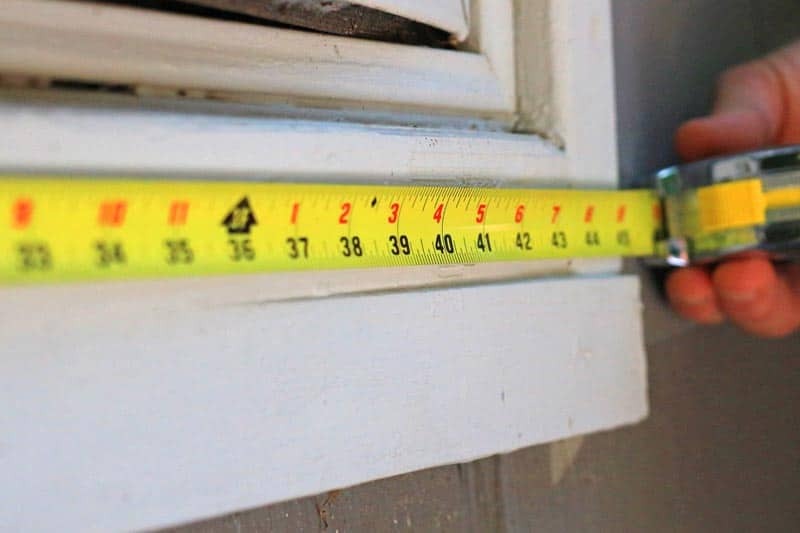 Measure using the instructions for functional window shutters. Decorative panels may still look functional if they are installed with authentic shutter hardware, but they will not be able to fully close if permanently installed with screws to the side of the window. Use a steel tape measure. Don’t attempt to measure with a yard stick or ruler. Employ an assistant to help with larger windows. Don’t assume similar windows are the exact same size. Check all windows to assure accuracy. A sturdy ladder is essential for safety when measuring tall or elevated windows.